We’d love your help. Let us know what’s wrong with this preview of Death Plays a Part by Vivian Conroy. But when a reenactment of a medieval trial in the castle dungeons ends in real-life murder, and accusations threaten the castle's future, Guinevere and Dolly dig deep into the island community's best-kept secrets to unmask the killer and save their Cornish summer. To ask other readers questions about Death Plays a Part, please sign up. 5☆ Full of Mystery, suspense, Drama & the best super sleuth Pup star of the book.... Dolly!!! Death plays a part is the first book I have read by Viv and I'm very excited to discover more of her books. I was thoroughly enthralled by the mystery and secrets surrounding the murder of Haydock and the island of Cornisea. Viv created a very magical, mystical feel to the Island. When Guinevere and Dolly embark on a summer adventure to help Lord Bolingbrooke catalogue books at he's castle. Whilst her 5☆ Full of Mystery, suspense, Drama & the best super sleuth Pup star of the book.... Dolly!!! When Guinevere and Dolly embark on a summer adventure to help Lord Bolingbrooke catalogue books at he's castle. Whilst her beloved theatre is renovated back in London. She wasn't quiet expecting to be involved in a murder investigation. When Guinevere and Dolly arrive in Cornisea she notices that the castle and The Cornisea Historical Society are to perform a Medieval re-enactment. They was to re-create the trial of Branok the Cold-hearted, the steward of Cornisea Castle, who had been accused of vile acts against the villagers under his care. She was so excited as it meant her Theatrical experience could be of use. On the day of the re-enactment tempers flare between people, particularly Lord Bolingbrooke and Haydock. It's no secret that they don't get on and Haydock really isn't a very likeable person. He certainly seems to know how to rub people up the wrong way! So when he is mysteriously murdered at the re-enactment everyone points the finger at Lord Bolingbrooke. I mean he was the last person to see him alive.... wasn't he?? Guinevere and Bolingbrooke's Son Oliver really don't believe that Lord Bolingbrooke killed Haydock. So they both set out to prove that he is innocent. Guinevere and Dolly make the best team!! Dolly the Dachshund by far stole the star role in my eyes. She was super intelligent, she has a nose for finding clues, and her interaction with humans and other pups is so heartwarming. Dolly knows exactly when Guinevere is sad or when Oliver needed reassurance. She has a huge loveable character. Go Team Dolly!! Oliver and he's Dad Bolingbrooke have a love/hate relationship. That said he was determined to save he's Dad. With the help of Guinevere and Dolly things start to unravel,cracks start to appear and secrets are no longer buried! Cornisea Island has a very magical feel to it. Stories of buried treasure and lots of secrets, make Cornisea a very intriguing place. The characters all have their fair share of secrets and lies.... but one thing is apparent... no one really likes Haydock! When Eal the local constable is called to the murder scene it's clearly obvious he doesn't really have a clue what he is doing. So they call for Inspector LeFevre to come help him out. I really liked LeFevre, he was so helpful and actually listened to Guinevere. It very much seemed like he was on their side and was willing to support their theories. Death plays a part has so many little surprising twists I was spun around in so many directions I didn't have a clue who the murderer was. Just when I thought I had an inkling....another secret uncovered, another twist in the truth. It was so nice not to have a clue, as it adds to the suspense and intensity. I felt like I was also playing a detective role as my mind was on overdrive trying to piece the clues together! Who can you trust? Who is covering for who? What secrets are just waiting to burst out? Such an exciting, enthralling, suspenseful mystery. Such a feel good read but still created all the tension and unease you need for a great murder mystery! The characters were very cleverly written, with secrets to hide. Uncovering the truth gave me tingles! I'm so looking forward to the next book Rubies in the Roses. Can't wait to catch up with Guinevere and Dolly again! The perfect read for those who love murder mysteries, twists and turns, plenty of secrets and lies, suspenseful, page Turner, perfect cosy feel good read and best of all..... Dolly... the super sleuth pup! DEATH PLAYS A PART (Cornish Castle Mystery Book 1) by Vivian Conroy is the first of a new cozy mystery series featuring Guinevere Evans and her adorable dachshund, Dolly. It is a clever locked room cozy set in an old castle on a tidal island off the coast of Cornwall. Guinevere is a costume designer for a London theater that has to close for renovations over the summer. She receives an offer to work and live at Cornisea castle cataloguing their library. She is excited to have a summer of island adventures with Dolly to tell all of her theater family about in the fall. When she arrives on Cornisea, she is immediately thrown into the mix of players that are producing a reenactment of the medieval trial of Branok the Cold-hearted. Arthur Haydock is playing Branok and is locked in a cell in the dungeon for the rehearsal and found stabbed to death by the cast. Only Lord Bolingbrooke has a key to the cell, but he swears he is innocent even though he and Haydock were at odds. Guinevere and Dolly, with the help of Oliver, Lord Bolingbrooke’s son who has returned after traveling the world, work to uncover all of the players’ secrets and motives for wanting Haydock dead. I enjoyed every aspect of this story. The plot was tightly woven and had me guessing until the end, even though I suspected who was responsible, I could not figure out the “How”. The pacing is steady and as you read the story, you are always given some new piece of the puzzle that makes you want to continue on. The setting of the castle and village on the tidal island was vividly described and a unique setting. Guinevere is a main character that I am looking forward to reading more about. We gets peeks into her past, but some things are still unclear. She is mature and steady even though she is only 24 years old, which could come from being raised by her grandmother and/or being on her own. One thing is certain, she and Dolly are a great pair. Oliver, Lord Bolingbrooke’s son, makes an interesting co-sleuth and possibly more in future books? Ms. Conroy portrays the islanders vs. the main landers mentality realistically and shows how it effects the characters’ moods and actions. I am looking forward to more Cornisea adventures with Guinevere and Dolly. This introduces Guinevere, who is a costume designer for the stage, and when her job entails her to take a hiatus for the summer she accepts a position on the Cornish coast. Her job will find her working for a Lord who is quite volatile at times. However, on her first day there a murder happens! Since she's an outsider and doesn't want to lose her job so soon, she works the case to save her boss. Along the way, Oliver, the boss's son, will help her. Its no secret that I love cozy mysteries. This one was right up my alley--great characters, a strong murder case, beautiful imagery, an isolated island in England, and, of course, a cute little dachshund. The 2nd book comes out in August and I can't wait to see what's in store for this cast of characters! This book is a mystery on many levels. The first one is why I decided to purchase it. I did apparently 12 days ago but I don't know what inspired this choice. Don't get me wrong it is not a bad book in any way shape or form. I just can't figure out what made me click buy now? This is a fairly cute, clean little story about a young woman Guinevere and her little dog Dolly who end up on the Cornish coast at a castle for the summer. Guinevere has been hired by the Lord of the castle to help catalog This book is a mystery on many levels. The first one is why I decided to purchase it. I did apparently 12 days ago but I don't know what inspired this choice. Don't get me wrong it is not a bad book in any way shape or form. I just can't figure out what made me click buy now? This is a fairly cute, clean little story about a young woman Guinevere and her little dog Dolly who end up on the Cornish coast at a castle for the summer. Guinevere has been hired by the Lord of the castle to help catalog his books. She needs a summer job because her regular job in a theater is on hiatus for renovations. Dolly is a bit of an enigma, she's young, she's orphaned and without any other family. She arrives at the castle which is on an island (this is an imaginary location based on Mount St. Michael ) and really insular. The Lord is a bit techno-phobic and his son, Oliver, seems to just be there to irritate him. The whole town seems a bit put out that the Lord refuses to commercialize the castle and allow them to profit from it. The local history society has convinced him to host a play about a previous villain who lived in the castle. During a rehearsal the local actor playing the villain is murdered in the castle dungeon and the Lord was the last to see him alive. Now Guinevere has to solve the crime before her new employer is charged. Every once in awhile I like to change things up and pick up a cozy mystery, there’s something comforting about these light mysteries that make for a nice change of pace. Death Plays a Part is the first book in a new series with an adorable and sweet lead character named Guinevere. Fans of this genre will adore her, she’s just a lovely character with that perfect combination of curiosity and charm that’s so appealing. This was a quick read with fairly fast pacing, the action begins right away, almost as soon as Guinevere arrives in Cornisea. The setting was both pretty and slightly spooky, it has a deep history and the residents like to tell old ghost stories and legends which added drama to the story. There was a gossipy, small town feel as well, especially as many of the members of the town had secrets they intended to keep. There were plenty of suspects to choose from and Conroy really kept me on my toes trying to figure out whodunnit. A good, quick, easy read. Love the setting. Very likable mc. An incredibly tightly written closed door mystery that I didn't have the first clue how to solve. Luckily for the detective on the island of Cornisea, Guinevere happened to be working in the castle for the summer, but is normally found in a theatre, often working on murder mysteries, so has a good idea how to try to solve them. Of course when Guinevere accepted the job in the castle the last thing she was expecting was a dead body on the first night, during a rehearsal for a historical reenactme An incredibly tightly written closed door mystery that I didn't have the first clue how to solve. Luckily for the detective on the island of Cornisea, Guinevere happened to be working in the castle for the summer, but is normally found in a theatre, often working on murder mysteries, so has a good idea how to try to solve them. Of course when Guinevere accepted the job in the castle the last thing she was expecting was a dead body on the first night, during a rehearsal for a historical reenactment, where most of the islanders were present. Given the set up of the murder, it was very hard to see past the obvious suspect, but yet Guinevere and Oliver between them try to prove the innocent suspect's innocence. Unlike in some cosy mysteries, this seemed a lot less bumbling along, and instead had two reasonably intelligent characters thinking aspects of the case through logically and in an informed way. They also seemed to have the ear of the inspector running the case, which seemed odd but useful. Guinevere doesn't go anywhere without her faithful dog Dolly, who is adorable. I loved Dolly' interactions with other dogs. Cornisea Island is a lovely setting for a series, and I am intrigued to see where this series is going to proceed next. What a brilliant closed door murder mystery this proved to be - I loved it! The Cornish Castle is on the island of Cornisea, linked to the mainland by a causeway during low tides and it is to this castle that Guinevere is going to work for the summer. She usually works as a theatrical costume maker but the theatre where she works is closed for renovations and one of the crew encouraged her to apply for this summer post cataloguing books in the castle library. She arrives to discover there’s a re What a brilliant closed door murder mystery this proved to be - I loved it! The Cornish Castle is on the island of Cornisea, linked to the mainland by a causeway during low tides and it is to this castle that Guinevere is going to work for the summer. She usually works as a theatrical costume maker but the theatre where she works is closed for renovations and one of the crew encouraged her to apply for this summer post cataloguing books in the castle library. She arrives to discover there’s a reenactment planned portraying the trial of Branok the Coldhearted and she looks forward to seeing if she can help in any way. What she and the other islanders didn’t anticipate is one of them being murdered whilst locked in a cell in the castle dungeon! With all the evidence suggesting the castle owner, Lord Bolingbrooke, is the killer it is up to his son, Oliver and Guinevere to uncover the islanders secrets and discover the perpetrator! The big mystery in this case is how someone could carry out the murder. Oliver and Guinevere work well together, with the help of her delightful dachshund, Dolly, and the support of the investigating detective. I was impressed how applying logic and Guinevere’s previous experience of murder mysteries in the theatre all slowly reveal more clues. It is somewhat reminiscent of a modern day Agatha Christie mystery with younger sleuths applying their little grey cells in a constructive manner to work out just how the murder was carried out and by whom! The setting for the series is brilliant, the characters well developed and easy to relate to, the plot is well structured with plenty of puzzles to confound the reader along the way. I highly recommend this delightful murder mystery and I can’t wait to read the sequel, Rubies in the Roses, and I’m so glad it is due to be released next month so there won’t be a long wait! With her theater closed for renovations, Guinevere lands a summer job cataloging books at a castle on Cornisea, a small island off the coast of England. Together with her little dachshund Dolly, she sets off, expecting an idyllic summer exploring the tiny island. When she arrives, she's delighted to learn that the castle is hosting a re-enactment of a historic trial, but when a man is found murdered in the dungeon and her new employer is accused, Guinevere jumps into action to find the real kill With her theater closed for renovations, Guinevere lands a summer job cataloging books at a castle on Cornisea, a small island off the coast of England. Together with her little dachshund Dolly, she sets off, expecting an idyllic summer exploring the tiny island. When she arrives, she's delighted to learn that the castle is hosting a re-enactment of a historic trial, but when a man is found murdered in the dungeon and her new employer is accused, Guinevere jumps into action to find the real killer, uncovering a greedy plot and family secrets. Thoroughly enjoyable first in a new series, with a charming location, rich plot and of course, an adorable Doxie. What more can you ask for in a cozy? I loved this from the very first page, I felt like I was right there along with Guinevere as she got off the train heading for Cornisea, I could almost feel Dolly tugging at the leash! The pace was perfect, introducing the characters with just enough detail to make them jump right off the page and setting up the puzzling plot full of twists and turns that kept me glued to the book. I enjoyed watching it all unfold, locked room mysteries are my favorite and I really appreciated Guinevere's thought process in solving it, no sudden AHA! moment for our girl, she sat down and figured it all out rationally. Go LOGIC! I do love a cosy mystery and I found this one rather better than some others I have read recently mainly due to the fabulous main character Guinevere and her adorable little dachshund Dolly who goes elsewhere with her. When they head off to Cornwall to work at the castle on the island of Cornisea they have no idea that they are about to become involved in a murder enquiry. I loved Guinevere and the setting here on Cornisea island. Vivian Conroy has created a visual feast where I found it comparat I do love a cosy mystery and I found this one rather better than some others I have read recently mainly due to the fabulous main character Guinevere and her adorable little dachshund Dolly who goes elsewhere with her. When they head off to Cornwall to work at the castle on the island of Cornisea they have no idea that they are about to become involved in a murder enquiry. Guinevere is a costume designer for a London theater company. When the theater closes for renovations, a friend helps her secure a temporary position on Cornisea Island on the Cornish coast cataloging the book collection of Lord Bolingbrooke. When she arrives, she discovers the local historical society is preparing for a re-enactment of an old island legend. Arthur Haydock, who is playing Branok the Cold-Hearted in the re-enactment, is also leading a push to take the castle and surrounding lands Guinevere is a costume designer for a London theater company. When the theater closes for renovations, a friend helps her secure a temporary position on Cornisea Island on the Cornish coast cataloging the book collection of Lord Bolingbrooke. When she arrives, she discovers the local historical society is preparing for a re-enactment of an old island legend. Arthur Haydock, who is playing Branok the Cold-Hearted in the re-enactment, is also leading a push to take the castle and surrounding lands from Lord Bolingbrooke and open the island and castle up to the public as a tourist destination. When Haydock is discovered stabbed to death in a locked cell in the dungeons of the castle following a practice for the re-enactment, suspicion falls on Lord Bolingbrooke. Guinevere and Bolingbrooke's son, Oliver, team up together to solve the case before Lord Bolingbrooke is charged with murder. This was a fun, quick read. The island characters are quirky and interesting. The mystery is well-plotted (despite a few cozy tropes -- slightly bumbling cops who need amateur sleuths to help them solve the case, stereotypical village residents, etc. But what's a cozy without a bit of trope?) with plenty of suspects, twists and turns. The ending was exciting and believable -- not overdone. I always enjoy a good locked-room mystery, and this one fit the bill! The story was a bit light (no in-depth characterization, no gory details about the crime, no hard-core investigation, etc) -- but this is a cozy mystery not a gritty procedural. Cozies are meant to be light, fun reads. Guinevere was a great main character....intelligent, insightful and determined. Her faithful dog, Dolly, added to the story with a bit of comic relief and a dash of doggie intuition. All in all, this was a fun, light summer read -- a perfect short book to read at the beach, on a summer trip, or on a warm afternoon lounging in the sun. Death Plays A Part is the first book in the Cornish Castle Mystery series. A second book, Rubies In The Roses, will be published in August 2017. I will definitely be reading the second book when it comes out! This was an enjoyable, light-hearted, cozy mystery, and I look forward to reading more by Vivian Conroy. Conroy has written other cozy mystery books including the Lady Alkmene and Country Gift Shop series. 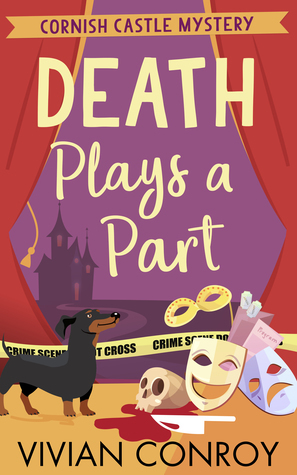 DEATH PLAYS A PART by Vivian Conroy is the first book in this utterly captivating, new cozy mystery series, and I am eagerly awaiting the second instalment. When the London theatre where Guinevere works as a costume designer, closes for the summer, she is delighted to have secured a position as a book cataloguer in Cornisea Castle off the coast of Cornwall, to while away her days. Along with her four-legged companion, Dolly, Guinevere is delighted to spend time in such a historical treasure trove DEATH PLAYS A PART by Vivian Conroy is the first book in this utterly captivating, new cozy mystery series, and I am eagerly awaiting the second instalment. When the London theatre where Guinevere works as a costume designer, closes for the summer, she is delighted to have secured a position as a book cataloguer in Cornisea Castle off the coast of Cornwall, to while away her days. Along with her four-legged companion, Dolly, Guinevere is delighted to spend time in such a historical treasure trove, and the stunning scenery and friendly village all combine to make Guinevere feel welcome and settled. But when a medieval re-enactment up at the castle goes awry and one of the actors is found murdered, Guinevere must unravel many secrets and lies to discover the killer. But who can she really trust? As always with Vivian Conroy's stories, the descriptive settings really come alive and I could picture myself standing at the castle window, or walking along the shoreline as the sun set over the village. The characters are a motley crew that are really likeable and unique in their own ways, and I enjoyed getting to know Guinevere who throws herself wholeheartedly into whatever situation she finds herself and wants to help wherever she can. Knowing little of her own family history, we can see how this has affected her in her decisions. With plenty of mystery, twists, turns, and misunderstandings, DEATH PLAYS A PART by Vivian Conroy is exactly what you want in a good book, and I imagine it would translate perfectly onto our TV screens. I am hooked on this new series and I invite you all to come and join the mystery tour - you won't regret it! This is the first time I've read anything from this author, and it won't be the last! Have had a blast being entertained by Guinevere, Dolly and crew and cannot wait for more! Guinevere is part of a theatre group and they've become her family. She gets the opportunity to head to Cornwall for the Summer to work at a castle and help catalogue the book collection there - sounds like my idea of heaven!! So off she sets with her faithful companion, Dolly the Dachsund, for a new adventure! Soon her adve This is the first time I've read anything from this author, and it won't be the last! Have had a blast being entertained by Guinevere, Dolly and crew and cannot wait for more! Soon her adventure turns to tragedy though as there's a murder at the re-enactment that she and some of the fellow villagers are taking part at. And the victim has annoyed an awful number of people so the clock is ticking to track down the murderer and Guinevere is up for the challenge! When she starts delving into the locals she finds out there's a lot of bad blood and tensions dating way back and it is fun to see her working out who to trust and what to believe. Conroy's novels are always packed full with the right ingredients for a perfect cozy crime story. She strikes a good balance so that when you've finish reading you don't feel stuffed, over indulged or filled up with extra spoonfuls of sugar but instead you are left wanting just a little bit more to satisfy your growing appetite for this author's books! There are traces of things like the Ladies's Detective Agency or something equally appealing from the ITV Sunday evening schedule in Conroy's wri Conroy's novels are always packed full with the right ingredients for a perfect cozy crime story. She strikes a good balance so that when you've finish reading you don't feel stuffed, over indulged or filled up with extra spoonfuls of sugar but instead you are left wanting just a little bit more to satisfy your growing appetite for this author's books! There are traces of things like the Ladies's Detective Agency or something equally appealing from the ITV Sunday evening schedule in Conroy's writing but there is also a lot of evidence of the influence of Agatha Christie in her books. Conroy's writing is warm, familiar, entertaining and well paced, but also show a secure understanding of how to set up and execute a good mystery story. She is able to manage the plot and characters effortlessly so that the reader is hooked and caught up the drama. For me her novel epitomises the cozy crime genre. This is a new series from Conroy and having read several of her other novels set in various countries and historical eras, it is fun to start with a new cast of characters and embark on a new journey with her. The Cornish setting is an inspired choice as not only does it remind us of summer holidays and Aidan Turner, it also reminds us of Du Maurier and other gothic novels set in the landscape which can be brooding and full of history. Even though the novel is set in a fictional location, it feels believable enough and it's a clever ploy to have an island, a causeway, the sea and a castle as this holds a delicious and enticing appeal for the reader. A new series and a new protagonist - meet Guinevere! As with Conroy's previous novels, the main character is a female and once again, she is likeable, pleasant and a perfect fit for this novel. Conroy is able to create characters who are full of energy, colour and spirit and it is easy to visualise and imagine the people and the scenes conveyed on the page. With the theatre where she works closed for renovations, Guinevere has no idea a simple summer job cataloguing books for Lord Bolingbrooke will quite so dramatic. I’m going to get a negative out of the way before I really get into my review. I absolutely loathed the use of ‘doggy’ to refer to Dolly the dacshund, because she is quite a strong and determined character in her own right and I felt this undermined her. Doggies aside, I thought Death Plays a Part was a fun read – which seems a peculiar With the theatre where she works closed for renovations, Guinevere has no idea a simple summer job cataloguing books for Lord Bolingbrooke will quite so dramatic. Doggies aside, I thought Death Plays a Part was a fun read – which seems a peculiar thing to say when murder is at its heart, but it so reminded me of a modern day Agatha Christie or P.G. Wodehouse. I really could see the book as hugely entertaining Sunday night television. What struck me was the totally consistent way Vivian Conroy carries through the entire conceit of drama, from Guinevere’s usual job in the theatre to her means of trying to solve the murder mystery with everything else in between. The whole structure of the story with the reliance on dialogue to move on the action made me think of a playscript too as I read. I would have liked a little more description at times too. I enjoyed meeting the cast of characters, and thought the way in which they were all interconnected as is typical of a small community was so cleverly organised. I think I might be a bit in love with Jago. But it is the plot that I enjoyed the most. I have no idea how Vivian Conroy managed to plan it as she did. She drops clues and red herrings throughout so that it’s very entertaining trying to keep one step ahead with Guinevere when so many others obfuscate the truth. I absolutely adored our main character, Guinevere. I warmed to her the moment I started reading, although that may be something to do with her adorable dachshund, Dolly. (Seriously, fluffy animals make EVERY story a 1000% more cute). Guinevere was a smart, capable protagonist, but she was also fully fleshed out–much more than *just* a amateur detective. The setting. The reason I was SO excited for this book was Cornwall. I’ve been going to the West Country most years since I can remember, and I w I absolutely adored our main character, Guinevere. I warmed to her the moment I started reading, although that may be something to do with her adorable dachshund, Dolly. (Seriously, fluffy animals make EVERY story a 1000% more cute). Guinevere was a smart, capable protagonist, but she was also fully fleshed out–much more than *just* a amateur detective. The setting. The reason I was SO excited for this book was Cornwall. I’ve been going to the West Country most years since I can remember, and I was SO looking forward to reading about a place I love so much! Although Cornisea Island is fictional, Vivian has managed to capture the UTTER charm of a close-knit Cornish community. DEATH PLAYS A PART was written beautifully. Every time I came back to the story, I felt a sense of calm–it was literally the definition of a ‘cozy’ mystery. It’s the perfect book to curl up with on a rain day, a large mug of tea in your hand. I don’t want to say a lot about the plot, because I’m a firm believer in not knowing too much before diving into a mystery. However, this story was tightly plotted, and I had NO IDEA who the killer was. The backdrop of Cornwall, and the the addition of a medieval reenactment was a great and original twist on the murder mystery genre, and this story felt fresh and exciting! Before I start my review I have to mention the cover to the book I love both the colours and the design it really is perfect for the story. With gorgeous descriptions of the fictional Cornisea and the people who live there it felt as if I had just arrived too and I was taking in the new sights and feelings. It really is easy to fall in love with the setting and the castle itself along with some lovely quirky and fun characters in Death Plays a Part. Guinevere is a lovely cha Before I start my review I have to mention the cover to the book I love both the colours and the design it really is perfect for the story. With gorgeous descriptions of the fictional Cornisea and the people who live there it felt as if I had just arrived too and I was taking in the new sights and feelings. It really is easy to fall in love with the setting and the castle itself along with some lovely quirky and fun characters in Death Plays a Part. Guinevere is a lovely character and I have to say I instantly liked her especially her tenacity in trying to discover who was behind the crime. I liked the pairing of Guinevere and Oliver as they teamed up to discover the truth and of course there has to be a special mention for Dolly the Dachshund she was just brilliant. I especially loved the scene where she was training Vivaldi and helping to keep him in his place, very cute! The murder certainly captured my attention and I have to admit my imagination was working overtime trying to figure out what had happened. I love a good mystery and this really is a brilliant one as I just couldn't seem to put the clues together properly. There is suspicion all around but what really happened? It's even more baffling as it is a closed door mystery which is always going to be a tough one to solve along with providing plenty of suspects. Well I have to say that if you love a cozy mystery than this book is ideal. It was so much fun trying to figure everything out but after a while I just decided to sit back and relax whilst Guinevere continued her sleuthing. After all she did seem much more capable than me! I didn't know which way the story would go so it was a joy to see everything play out. The plot moves at a pretty good pace so I never found myself losing interest in either the story or the characters. Reading Death Plays a Part was a wonderful way to spend my evening and I can't wait to read the next in the series, Rubies in the Roses. A fabulous start to the Cornish Castle Mystery series! With thanks to Vivian Conroy, HQ Digital & Netgalley for my copy. This is my honest and unbiased opinion. I liked Death Plays a Part, but it wasn't as good as Vivian Conroy's other books. I felt it was a little too predictable, although I enjoyed the setting and the identity of the murderer was well hidden. This is the first in the Cornish Castle Mysteries, and I hope the subsequent books will be better. Guinevere works in a theater company in London, but needs a summer job while the theater is being renovated. She, along with her dog Dolly, gets a job cataloging a library on a quaint island called C I liked Death Plays a Part, but it wasn't as good as Vivian Conroy's other books. I felt it was a little too predictable, although I enjoyed the setting and the identity of the murderer was well hidden. This is the first in the Cornish Castle Mysteries, and I hope the subsequent books will be better. Guinevere works in a theater company in London, but needs a summer job while the theater is being renovated. She, along with her dog Dolly, gets a job cataloging a library on a quaint island called Cornisea off the coast of Cornwall. When she arrives, she meets Lord Bolingbrooke, her employer, and his son Oliver. The castle is about to stage a reenactment of the trial of Branok the cold-hearted. Branok was a cruel man who supposedly burned a family alive, and is now an island legend. During the reenactment practice, one of the main actors is found dead in the castle dungeons and Lord Bolingbrooke is accused of the murder. Guinevere and Oliver need to solve the murder to keep the Lord B. out of jail. This was a quick read. The characters were fun but a little shallow, and the setting was well described. Just under a month ago I was thrilled to be part of the double cover reveal for Vivian Conroy's new Cornish Castle Mystery series and I still can't get over how cute the covers are -- especially now that I know how perfectly the first one, at least, matches what's inside! I knew as soon as I saw the description that it would likely be one that my theater-loving Cornwall-obsessed self would love, and I wasn't wrong. The first of Vivian Conroy's Cornish Castle Mysteries is yet another fantastic tal Just under a month ago I was thrilled to be part of the double cover reveal for Vivian Conroy's new Cornish Castle Mystery series and I still can't get over how cute the covers are -- especially now that I know how perfectly the first one, at least, matches what's inside! I knew as soon as I saw the description that it would likely be one that my theater-loving Cornwall-obsessed self would love, and I wasn't wrong. The first of Vivian Conroy's Cornish Castle Mysteries is yet another fantastic tale with characters I just can't get enough of! Guinevere is absolutely my kind of girl. She loves books and history and the theater and her sidekick dachshund, Dolly. When faced with a locked-room murder happening right under her feet, she uses her knowledge of theatrics and mystery stories to come up with possible scenarios -- even acting them out with make-shift displays like one would use in order to plot out placements for a theater production. She's smart, she's spunky, she's caring ... and I could totally see us being friends. That's one of the great things about Vivian Conroy -- whether she's writing about 1920s London socialites, or present day "normal" gals in Maine or Cornwall, she has a knack of being able to create heroines I would love to call my friends. She also adds the right combination of supporting characters to keep things interesting and the men? Well, let's just say that I would definitely trade shoes with Guinevere for a few pages if it meant quality time to be had with Oliver .... just like I still swoon with a mere thought of Jake from the Lady Alkmene books. I can't wait to revisit the castle, its inhabitants and their neighbors in Rubies in the Roses! Guinevere arrives at Cornisea castle in Cornwall to take up a summer job cataloging the treasured books of Lord Bolingbrooke. The theatre where she works has closed for refurbishment and Guinevere jumps at the chance to work on the beautiful Cornish island, with its ancient legends and folklore. Guinevere is accompanied by her trusty little Dachshund, Dolly, and will be residing at the castle for the Summer. On arrival, she finds an ancient trial re-enactment taking place by residents, but the a Guinevere arrives at Cornisea castle in Cornwall to take up a summer job cataloging the treasured books of Lord Bolingbrooke. The theatre where she works has closed for refurbishment and Guinevere jumps at the chance to work on the beautiful Cornish island, with its ancient legends and folklore. Guinevere is accompanied by her trusty little Dachshund, Dolly, and will be residing at the castle for the Summer. On arrival, she finds an ancient trial re-enactment taking place by residents, but the atmosphere soon changes when a murder is discovered in a locked dungeon. It is down to Constable Eal and Inspector LeFevre, to solve the case, but Guinevere has ideas of her own. She is helped by the dashing Oliver who is the son of Lord Bolingbrooke. His father is the main suspect of the crime and the duo plus Dolly don’t leave any stone unturned to clear his name. First, she must meet the residents and learn about their characters and their backgrounds. Dolly helps to break the ice with the small community and gradually they begin to trust her. Guinevere’s theatrical background helps her unravel the mystery bit by bit. The inhabitants of the island are worried about their livelihoods and appear guarded, there is an air of suspicion and mistrust to the once close-knit community. As an added dimension there is talk of lost treasure, does it exist? and who knows the secret? There is a hint of Agatha Christie to Vivian Conroy's writing and she beautifully describes the magnificent backdrop, and the plot is intricate and solid. She keeps the Cornish theme alive with Cornish names for the characters and interesting fictional Cornish folklore. Guinevere and Oliver make a great team, Oliver is well traveled and Guinevere has a good head for puzzle solving, is there a slight hint of romance between the amateur sleuths? Any Dachshund owner will relate to Dolly’s character, she is inquisitive and full of energy. The bond between Guinevere and Dolly is truly adorable, you get the feeling that they know what each other is thinking and Dolly is constantly at her companion’s side. I have given the book a very well deserved 4/5 stars. I am eagerly awaiting the next book in the series, Rubies in the Roses which is published soon. Death Plays a Part by Vivian Conroy is the first book in the new series A Cornish Castle Mystery. Guinevere Evans and her dog, Dolly are heading to Cornisea Island on the Cornish coast. Guinevere is a costume designer at a theater in London. The theater is closing for the summer to do renovations and Guinevere would be at loose ends. Mr. Betts, theater director, helped her acquire a job cataloguing books for Lord Bolingbrooke at Cornisea Castle. Guinevere arrives to a little kerfuffle between Lo Death Plays a Part by Vivian Conroy is the first book in the new series A Cornish Castle Mystery. Guinevere Evans and her dog, Dolly are heading to Cornisea Island on the Cornish coast. Guinevere is a costume designer at a theater in London. The theater is closing for the summer to do renovations and Guinevere would be at loose ends. Mr. Betts, theater director, helped her acquire a job cataloguing books for Lord Bolingbrooke at Cornisea Castle. Guinevere arrives to a little kerfuffle between Lord Bolingbrooke and his son, Oliver. Oliver is a documentarian who has just returned to the castle after his latest excursion. He has been trying to convince his father to open Castle Cornisea for public tours. Guinevere discovers that the Cornisea Historical Society is recreating the trial of Branok the Cold. At one time, he was the steward of Cornisea Castle and accused of vile acts against the villagers. There is a rehearsal that afternoon. Arthur Haydock is playing Branok and fireworks are sure to abound. Arthur and Lord Bolingbrooke do not get along. They have differing view for the castle and island. Haydock is put in a cell for the rehearsal. When they return, Haydock in on the floor with a knife sticking out of his chest. Lord Bolingbrooke is suspect number one. Guinevere believes he is innocent and embarks on a mission to prove it with Oliver’s assistance. Cornisea Island is a small community that Guinevere discovers is rife with secrets. Who killed Haydock and why? Can Guinevere uncover the killer and save Lord Bolingbrooke? Death Plays a Part sounded like a cute cozy mystery. The book has a slow pace that would put Loralei Gilmore (she drinks vast quantities of coffee) to sleep. A majority of the story is Guinevere running around the island (with her dog) talking to the locals who are wary of strangers. I wished the author had fleshed out her characters (especially Guinevere). We are given very little information on Guinevere. The mystery was intriguing (treasure). The killers’ identity, though, was easily discerned (at least I thought so). I identified the killer after Haydock was discovered dead in the cell. The suspect pool is limited. How the murder was accomplished, though, was clever. I am rating Death Plays a Part 3 out of 5 stars. The reason for Guinevere to investigate the murder is flimsy. She dislikes unsolved crimes plus she is curious. It is a weak excuse since London has dozens of unsolved crimes every week. I wish the author had provided a pronunciation guide for the Cornish names. I would rather the mystery had been set at the theater in London (so many possibilities). I was hoping Rubies in the Roses (second book in the series) would return Guinevere to the theater in London, but she will be continuing her stay on Cornisea Island. When she arrives at Cornisea Castle, she finds herself helping out with a re-enactment of the medieval t Guinevere is a costume designer for a London Theatre, that unfortunately has to shut down due to renovations, leaving Guinevere in a little slump of what to do next over the Summer. She is kindly offered a job to work and live at Cornisea Castle, cataloguing their library. Guinevere jumps up at the opportunity, excited to see what adventures she and her partner in crime, Dolly, can get up too. When she arrives at Cornisea Castle, she finds herself helping out with a re-enactment of the medieval trial of Branok. However, the re-enactment takes a turn for the worst and what was meant to only be a production for Cornwall to enjoy, became a murder mystery Cornwall couldn't comprehend. Arthur Haydock, who was cast as the role of Branok, was found murdered in a cell during rehearsals. Lord Bolingbrooke was the only one with access to the cell, however, denies having anything to do with Arthur's death. It's now down to Guinevere and Dolly to find out who is setting up poor Lord Bolinbrooke and get them locked away for the murder of Arthur Haydock. I always love a good mystery book and this was definitely one I could find myself curled up cosy on the sofa with, joining little Dolly and Guinevere on their adventures in Cornwall. 'Death Plays a Part' is a very light-hearted murder mystery story with a nice change of pace throughout. The plot was interlaced so well that it was hard to guess who the murderer could have been and although I had my suspicions, I could never find a good enough reason behind it myself. Vivian doesn't leave you hanging until the very end, she gives clues a long the way, helping you piece the puzzle just a little more each chapter. With it's beautiful setting on the Cornish coast and its charming lead, Death Plays a Part makes for an enjoyable reading experience. It is a cozy mystery that will appeal to a wide range of ages. Guinevere is a costume maker, but as the London theater she works for is being remodeled, she has taken a job cataloging the library of Cornisea Castle. Her arrival coincides with the rehearsal of the trial of a historic villain from the area. The intention is to draw tourists, but police are drawn instead as one of the cast is murdered. Haydock is a thoroughly despicable man, but it looks like Lord Bolingbrooke was the only one with an opportunity. Though he has a definite motive, Lord Bolingbrooke proclaims his innocence, and Guinevere believes him. With the help of Bolingbrooke’s prickly son Oliver and her dachshund Dolly, Guinevere sets out to prove his innocence and find the real killer. As a cozy, Death Plays a Part isn't very serious, but it does ask in various ways what are children's (grown) responsibilities towards the past. The small island is struggling economically and the question is how to maintain tradition while bringing in the tourist dollars that the economy needs. This is an issue facing many areas, so it is easy to accept its role in Death Plays a Part. The mystery is fairly straightforward as there are few possible suspects, but despite its simplicity the novel is quite enjoyable. As the next novel in the series is set in the same area, I hope more time will be spent on characterization. Apart from Guinevere, the other characters were shallow depictions. This is the novel’s main weakness. I look forward to giving Vivian Conroy's next novel a try. I received a copy of Death Plays a Part from the publisher and Netgalley.com in exchange for an honest review. I loved the premise of this story; Theatre Costume Designer Guinevere and her cute Daschund companion Dolly were off to spend the summer in Cornwall working for the owner of an ancient castle on the fictional island of Cornisea, off the coast of Cornwall. Sounds like a perfect summer working vacation to me as Guinevere was to help catalogu This is the first mystery novel I’ve read and also the first book by Vivian Conroy so two firsts. It’s so good to open your eyes to new genres and new authors. Guinevere and her delightful Dachshund Dolly are marvellous characters, Guinevere is a very likeable character that readers will take an instant liking towards. The plot is interesting and well thought out, with plenty to keep the reader guessing as they try to piece together all the clues to solve the mystery. Superb descriptions of the setting of Cornisea really make the place come alive from the pages, I felt like I was there and able to see the sights. Likewise, the characters really come to Guinevere and her delightful Dachshund Dolly are marvellous characters, Guinevere is a very likeable character that readers will take an instant liking towards. The plot is interesting and well thought out, with plenty to keep the reader guessing as they try to piece together all the clues to solve the mystery. Superb descriptions of the setting of Cornisea really make the place come alive from the pages, I felt like I was there and able to see the sights. Likewise, the characters really come to life through the skilled writing making this a delightful and enticing read. I’m trying desperately not to say too much about the plot, I think this is the sort of book that hints would give away too much and spoil it for others, but it’s well written and paced just right for an enjoyable and exciting read. Fans of Conroy’s previous books which feature Lady Alkmene Callender should hopefully enjoy this book, and I would say that fans of cosy crime in general would enjoy this one! Death Plays a Part is a fun and traditional murder mystery. Guinevere interviews everyone on the island and follows all the clues until she can work out With her London theatre closed for renovations. Guinevere takes on a summer job at the castle on the Cornish island of Cornisea. What she doesn’t expect is to be witness to a murder with her new boss, Lord Bolingbrook, as the prime suspect. Determined to clear her employer’s name, Guinevere teams up with his son, Oliver, to find the true culprit. I am a big fan of Agatha Christie, so when I discovered one of the influences of this author was Agatha Christie too, I looked forward to a good read of a Cornish pace of life, with good characters and a murder thrown into the mix early and I wasn't disappointed. All the clues were there for those intent on finding the killer before the last few pages, but I enjoyed the story telling and allowed the plot to unfold with a few' ah, yes' moments as bits of the story came together. Stunning contrived plot. A really brilliantly thought up closed room murder. Who killed him? How did someone manage to get into a closed room and kill the most hated man on the village? Unless she can answer that it is very possible that an innocent man will be convicted of murder. A really well written book. If you like a really good mystery on a par with Christie then this is for you.